My family has a slight pasta obsession. Not just a little bit, but my two boys are currently refusing 99 percent of all food, with the exception of pasta. They love pasta and would eat it three times of day if given the option. Since my husband isn't currently eating pasta I have had free rein to make any type of pasta that I chose. 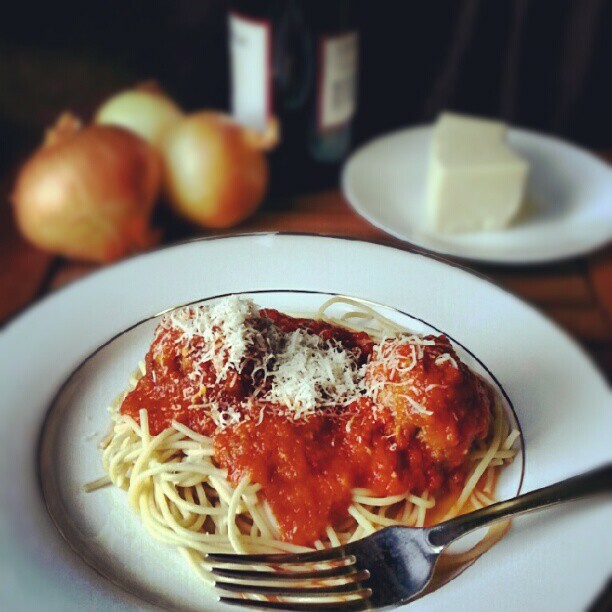 While I love pasta, I really love homemade pasta sauce and meatballs. Growing up my mother's idea of homemade pasta sauce was to add vegetables to jarred sauce. Granted it never tasted bad and I loved it. That is until I realized that homemade pasta sauce is no comparison. It is so much better! Last week I tried a new recipe for $4 Spaghetti That's Almost as Good as $24 Spaghetti from the August issue of Food and Wine magazine, which looked simple and delicious. This recipe has 9 ingredients. It takes 3 hours of total time, 30 minutes of which is active and makes 4 to 6 servings. I did make a few modifications to the recipe. I think I maybe one of the only food bloggers on the internet that does not own an immersion blender. Everyone I know keeps telling me that I have to buy one and that I will love it. However, I have stubbornly stuck to my blender. For this recipe I poured the tomatoes, garlic, oil and mushroom broth into the blender and pureed until smooth. Then I added it back into the pan and followed the remainder of the recipe as written. I did leave out the torn basil leaves due to the fact that I completely forget to buy them at the grocery store (opps). My family was very impressed by this recipe. The flavor from the garlic oil and mushroom broth made for a great tasting sauce and my husband thought this maybe one of the best pasta recipes he has ever eaten. The mushroom broth creates a great undertone to the sauce and makes a delicious taste combination. I made veal meatballs to go with this pasta recipe and the combination was perfect. A great recipe that I will definitely make again. For the recipe go to $4 Spaghetti. yep....this is the recipe I use..and add garden basil. I have never met a person who didn't like it! Garden basil in the best :) I agree that this recipe is delicious! The recipe sounds amazing!! I am dropping by via the 99% Weekday Hop. Ive been great :) Thanks for the sweet comments and for hosting!